Sometimes I go on a trip via memory lane. A mode that I mostly call this time that year...I just sit and think about all the incidents that took place in the past years. Have you ever done that? try it for once and you would be amazed to see what life has made you experience so far. Today was one such day and I was thinking about the beautiful spring colours that we experienced last year in Japan. The beautiful Cherry blossoms, the burst of colour in all its true senses and the fragrant world that I could never imagine exist. It was like Paradise on Earth. The most beautiful season that we never get to experience at this side of the world. But then again nothing feels like home and home cooked food. and the recipe I am going to share today helps to beat the heat at this side of our world. 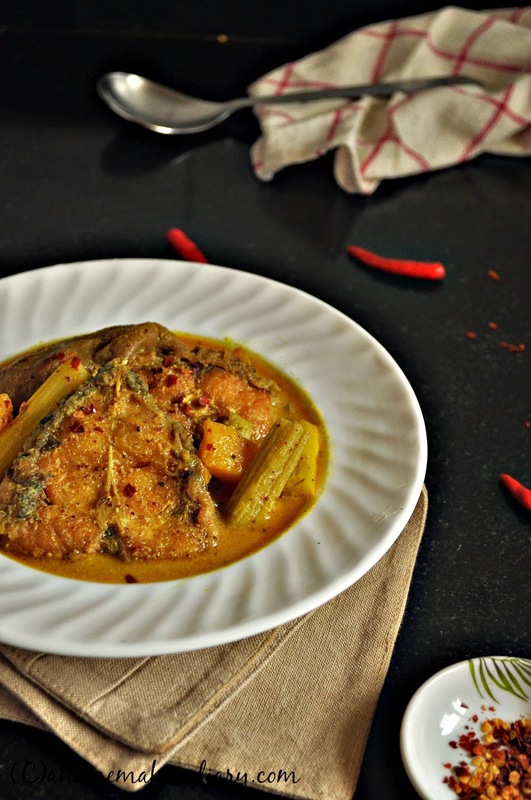 Macher touk or Fish in a dry mango and mustard gravy belongs to the coastal areas of Bengal. If you look at the map of West Bengal you will find a small coastal region on the extreme south end of this state.This belongs to the Purba Medinipur district and both my parents hail from this area. Like all coastal region the food here includes a lot of sea fish and coconut. The people around the coast are not very well off but thanks to the fertile land and plenty of ponds and water bodies they at least get two square meals most of the days. Their everyday diet comprises of rice, local greens growing almost every where and fish. The cooking process is very short and simple but the food is deliciously aromatic with a perfect sweet-sour-spicy-salty balance. It is believed that eating spicy hot food keeps your body cool by making you sweat. I have seen this tradition is followed in almost all the Coastal areas which are hot and humid at the same time. And to balance the heat and spice they also use a lot of souring agents. Coastal Bengal is no exception. Unlike most Bengali homes sour food like Macher touk is a part of their daily diet and I must add the Touk here is not mellow and sweetened with sugar. Rather it celebrates the sourness with a stark pungent- sour taste. The two types of touks that are popular here and cooked almost everyday are Amchur er touk or Fish cooked with dry mango and mustard paste or Tentul er touk (tamarind based fish curry) which is little sweet. The other versions use Tentul phul (tamarind flower), Tentul pata (tamarind leaves) and Lebu (Lemon). I Cherish these old traditional recipes. They tell me stories. Remind me of people who loved eating them, who loved cooking them for their dear ones and make me realise that we need to carry it forward to make new memories for the coming generations. To read more about the Coastal Bengali life please read HERE. 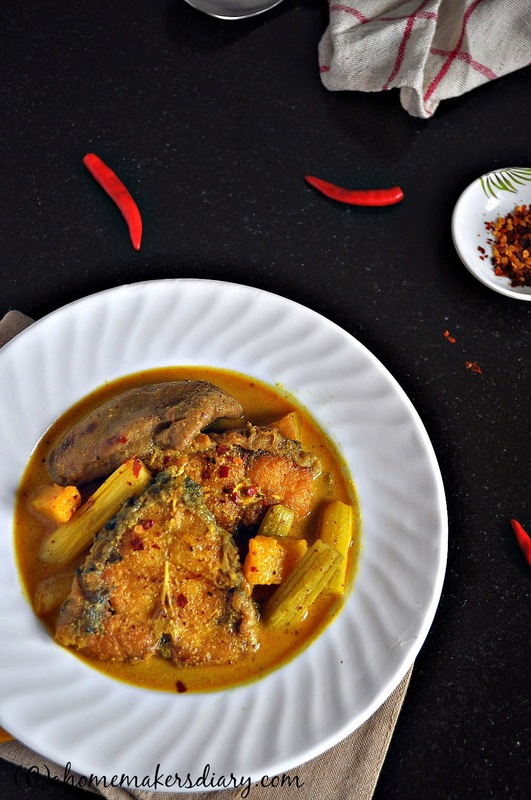 Here is my recipe for Macher Touk, which is my father's favourite and I have seen this being cooked all my life. Now a days I always have a glass jar full of soaked Amchur in my fridge to save time. If you plan to make Amchur this is the right time when the two essential elements of Raw Mango and Sunshine are available in plenty. For recipe please go HERE. To cook it with RAW MANGOES please see the notes. Rub the fish pieces with salt and turmeric and marinate for 15 minutes. Soak the Amchur pieces or the powder in 1 cup warm water. keep aside. Soak the mustard paste in 3/4 cup water. Keep aside. If the amranth stems are very thick then make a small cut in them lengthwise. Be careful not to cut through. This will help it to absorb the spices. Heat oil in a heavy bottom pan and fry the fish pieces lightly, say a minute on each side. Do not over fry the fish as the sour amchur will make it hard. take out and keep aside. Take 2 tsp oil in the pan and temper it with panchforon and dry chillies. Cook till you get the nice aroma. Immediately add the pumpkin and Amaranth stems. Add little salt and turmeric and stir to combine. cover and let it get cooked for 4-5 minutes. Stir intermittently. Once the veggies are soft increase the heat and carefully pour the mustard water so that the black husk does not get in. LEt it come to a boil then add the Amchur water. If using dried mangoes then mashing them a little will help for the sour taste to come out. Adjust salt and turmeric, give it a good stir and cover. Let it come to a boil and then add the fish pieces. cover and let it simmer on medium for another 6-8 minutes. if you like you can add few whole green chillies into it. You can mix the soft chilies with your rice and the gravy while eating. I definitely would suggest that but its your personal preference. The gravy would be slightly thick with a balanced sour salty spicy taste and the veggies should be soft. Once you get that just pour few drops of mustard oil to intensify the flavour. Serve hot or at room temperature with steamed rice. The sourness will depend on the taste of the amchur. So please increase or decrease the amount specified in the post as per your choice. Now that raw mangoes are available in the market you can also cook it with raw mangoes. Peel and cut mangoes in thick strips. Fry the pumpkin and other vegetables with a pinch of salt till tender, Take out. Heat oil and panchforon and then add the mango pieces, add salt and cook till they are soft and mushy. Add mustard and proceed through the recipe. add the fried veggies along with fish. To get the recipe of the same dish with tamarind visit Sharmila's page. That tip for keeping soaked amchur in the fridge is great! Maacher piece ta tule nite icche korche. 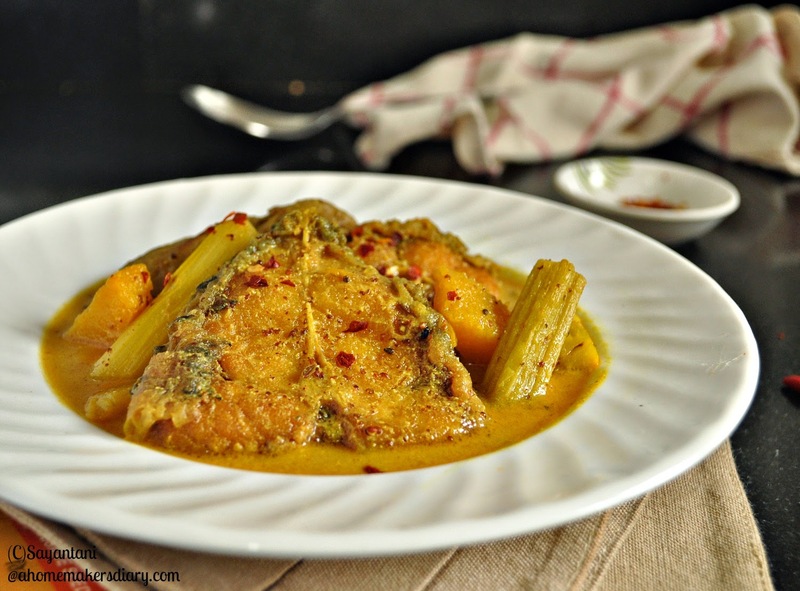 Wat a delicious,droolworthy and mouthwatering dish, seriously hard to resist.Mango and fish curry is always my fav, this macher tauk is quite different, bookmarking.